Cary Godette left some indelible impressions on those whose paths he crossed three decades ago in what was then simply known as Ficklen Stadium. Since those days of violent collisions, he's been teaching others the finer arts of dishing out bruises. One of East Carolina's finest running backs during Godette's era, Eddie Hicks, admitted that he simply didn’t run at Cary Godette during practice. One of the Pirates' finest ever defensive ends, Zack Valentine, said his own greatness was due in large part to opponents running at him and away from Godette. One of ECU’s greatest coaches, Pat Dye, said Godette was the finest defensive end he ever coached. 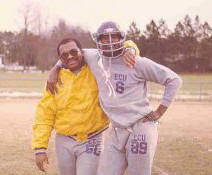 Cary Godette dominated the defensive line of scrimmage at East Carolina almost from the moment he arrived on campus in 1972. His 5-11 frame belied a tenaciousness that would make him a legend at East Carolina. He would go on to finish his Pirates career as an All-America selection and follow it with a stellar coaching career. Today, he is taking a one-year hiatus from his coaching career to rehab from knee surgery. The year off, literally his first out of football since middle school, has afforded the coach an opportunity to refocus his career and actually reconnect with his alma mater in a way that he had not been able to do since his days as a player. This past season, the ECU Hall-of-Fame player returned to the very place he spent four years dominating offenses and reconnected with his old friends. As he heals up and contemplates where his next coaching job will be, the veteran coach of all levels of play — high school, college, and the NFL — reflected on his experience as a Pirate. Godette always had two dreams growing up. First, he wanted to go to college and second, he wanted to see the world. It would be football that blazed the path to both objectives for the young football star from Havelock. On the farm, Godette learned the value of hard work. For Godette, football was the only game to play and he saw it all on his prep team. When Godette played at Havelock, the program was not quite the winner it came to be, but the head coach, Frank Caimello, was beginning to develop the program that would become a proven winner over time. Godette was part of that foundation. “We pretty much established the traditions there,” Godette said. “There were about 18 of us that played on the varsity as sophomores and got the crap beat out of us. Then, as juniors, we played and got better and would hang with a team for a half and then wind up losing in the second half. I only played on one winning team in football in high school. Godette sensed, at that age, that he was part of something special and there was a possibility that he could go to the next level. “Well, you know, its like anything else, you grow up always dreaming about going to college on scholarship and playing college football,” Godette explained. “As I got into my junior year, I was dreaming about it more and more. And then as a senior, we started so good — we went to the 10th game before we got scored on — so we knew we were on a pretty good team. I had never been on a winning team, so when it started, we were just hoping that we would end our high school careers on a winning note. And it turned out to be a very special team. While Godette sensed he had the goods to play on the next level, he found that it was not all that easy to catch the eyes of the major college scouts when they were looking for the 6-3, 6-4 defensive tackle. And even though he was making plays all over the field for Havelock, Godette didn’t know if anyone was taking note. One person was. Former Pirates standout Wayne Lineberry — then a graduate coach for the Pirates — was well aware of the talent packed into the 5-11 Godette, and he told then-coach Sonny Randle all about the Havelock stalwart. Randle sent the invite. As the first in his family to go to college, Godette was not only in awe of the football program, he was also impressed with the collegiate environment as a whole. College football also provided a nice additional benefit. The Pirates were coming off a losing season — Randle’s first at the helm — and Godette had gotten the chance to watch the team in action a couple of times during his senior year at Havelock. He saw potential. Where he may have struggled to stay afloat in adjusting to college life, he seemed to adjust quite fine to the football. Ever the deflector of praise, Godette offers a reason for his instant impact as a freshman in 1972. “I think what worked for me was the fact that I was fortunate to come in when there were not a lot of seniors on the team,” he explained. “Maybe eight (seniors were on the team) when I came in, so it worked in my favor. These guys set the tone about what it meant to be on a championship team. Even though there were only eight seniors, they were great leaders. As a freshman, all I had to do was come in and do what I was told and follow suit under the leadership of guys like Les Strayhorn and Jim Post. After a solid sophomore campaign, Godette was eagerly anticipating his junior season. He attributed his sophomore success to his quickness. For many players, a coaching change halfway through their careers could be alarming, but for Godette, when Randle packed his bag for Virginia and an unproven Pat Dye rolled in from Alabama, the rising junior barely flinched. “For me, it was kind of like when I was in high school,” he explained, “I had several coaching changes so it wasn’t like it was overwhelming because I was still young and trying to get adjusted. But it was like night and day when the coaching changes eventually took place. The two men were like two ends of a spectrum. When Randle was there, we ran around a bunch and the practice was shorter. We weren’t quite as physical as when Coach Dye came in. When Coach Dye came in, the Wishbone came in and I had to change positions going from a defensive end to a nose guard. He admits that he was the logical choice for nose guard in Dye’s odd front defense. By moving him to nose guard, Dye could get another top player on the field at linebacker. Godette was excited and ready for his junior season, but the week before the season opened, he blew out his knee and lost the whole year. It wasn’t his first injury as he had hurt his shoulder as a prep player, but it was the first time he was not going to play football. “We were in game week when I tore my knee up,” he recalled. “I had hurt my shoulder in high school, but I didn’t really know what the problem was because nobody ever told you you were hurt back then. When I came to East Carolina as a freshman, my shoulder kept slipping. I played in a shoulder harness my first two years of college football. So I had my shoulder operated on at the end of spring practice or actually a day or two after spring of my freshman year. Well, my sophomore year about the fourth game of the season, they said I was out for the year because I had taken a blow on the shoulder and bent the staple. The team physician said I was through for the year, so Randle packed me in the car and drove me up to Virginia and took me to a highly regarded orthopedic doctor and he said I could play. So my first two years, I played with my arm strapped down to my side… I played with one arm basically. If there was a setback due to the injury, it was awfully hard to detect it as Godette turned in a typical stellar season, culminating in being named an honorable mention All-America. While Godette will forever hold Sonny Randle in high regard — he was the man who gave him the chance — you sense a special admiration in Godette for Dye. “The thing that impressed me about Coach Dye was that he was a hard-nosed football coach who was very fair,” he said. “He brought a toughness. Watching him operate, he was a people person and he could interact with all types of players from all kinds of backgrounds. It didn’t matter if you were black or white, rich or poor, it didn’t matter. And, he was the same way dealing with alumni and those types. Didn’t matter to him if he was talking to a farmer chewing tobacco or in a three-piece suit talking to a banker. I mean, he was just an individual who would adapt to the situation. “On the recruiting end of it, the athleticism went way up. The speed factor went way up, big-time. We got bigger and faster and for the first time, he gradually built a weight program. By the time I was a senior they were emphasizing who was lifting 300 pounds. And when I was on the coaching end of it, I got a chance to see him take things to a new level. Dye, who in an interview in the 2004 Bonesville Magazine, called Cary Godette the finest defensive end he has ever coached, was clear on his feelings about his former player at East Carolina. Despite a 9-2 campaign his senior season, Godette was disappointed on multiple fronts. The postseason brought more honors for Godette, but the disappointment of the season could not be diminished. His 2004 visit to his old stomping grounds was long overdue, he said. Arizona Cardinals (2003, Defensive Line). Coaching, actually, had gotten into Godette’s blood back in high school at Havelock. He played for legendary Rams’ coach Frank Caimello, who had an impact. Unlike most players who jump right into coaching, Godette found the transformation palatable — mostly due to the residual respect his name commanded within the Pirates ranks. “Really and truly the transition from the end of my senior year playing to the first two years coaching was very, very easy,” Godette said. “It could have been very rough had I been in another place, but the guys gave me a lot of respect from having played there. The guys I ended up coaching were guys I played with. They were young guys when I was a senior so stepping in those two years was easy. I didn’t really realize what coaching was all about until my third year, because the first two years I was coaching really good players, so it was real simple to turn them loose. So mistakes I was making as a young coach, they were talented enough to overcome my coaching. Now my third year I had to coach because those good players had gone on. Give you an example, Zack (Valentine) was a junior and senior and went on to the NFL in the second round. And Fred Chavis, who was a defensive end that was fast enough that he winds up going to the Oakland Raiders as a free safety, and I guys like John Morris who was a tough son of a gun… those guys made coaching easy. Though the team was young, Godette was getting the benefit of working with a set of good college coaches under Dye. A lesson learned for a young coach. More importantly, Godette was able to work within a comfortable environment to learn the business of collegiate coaching. Having dreamed of travel, the young coach got more than he bargained for over his career and it started rather abruptly in 1980 when Dye tendered his resignation and went west to the University of Wyoming. His Wyoming stint turned out to be one in which he learned a whole lot about coaching and, more importantly, he learned that he could succeed without being in the safety zone of his former coach and mentor. “I was blessed again at Wyoming with two players who were seniors,” Godette said of the situation at Wyoming. “One of them ended up being a fourth round pick with the Bengals and the other was a real heady football player. I was very fortunate to be around some good players and others who had great ability that you could nurture and bring out their best. That methodology has served Godette well so far in his career as he has a reputation as a players’ type of coach — a guy who not only knows what he teaches from the Xs and Os standpoint, but also from vast experience in the trenches. And in the trenches is where Godette has found himself, for the large part — working in the trenches. One place Godette stayed a while was at the University of Cincinnati, where he spent six years. The experience made such an impact on Godette, it forced him to re-evaluate his career. Taking the Terry Sanford job required him to tell then East Carolina coach Bill Lewis, “No thanks” after the Pirates’ skipper called him about a position on his staff. “Bill called and I told him, ‘I think I’m going to get out of (college coaching) and go down to Terry Sanford,” Godette said. “I was all set to go to high school and stay awhile. Then, Bill sent Tom MacManus down to Fayetteville and we talked at the end of that season, which was Bill’s first season at East Carolina. Well, I changed my mind and came onboard. When I came on board, I was filling one spot for a coach who had just left. Within three weeks of being on that staff, I was the only defensive coach on that staff. The other three guys left. It was 1990 with virtually a whole new defensive staff. So, the 1990-91 seasons there, of course (1991) was a great year, basically one of the things I did was compare the kids to when I was there in 1972-79, and ... they were the same type of kids who just enjoyed the game and had a good time and were just good people. “So, that was what was very enjoyable about being back in Greenville was that it had not changed… the people were enjoyable to be around and you knew you always had a chance to win. That was the big positive that came out of being back at ECU. The 1991 season reinvigorated Godette and rekindled a long-time dream. “After I got around those kids in 1990 and had basically come back home,” he said. 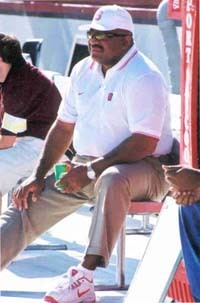 “In 1991, we had the good year and Bill leaves and goes to Georgia Tech and then I followed Bill down there because East Carolina was (delaying) the hire of Steve Logan and I had an offer in hand. Going to Georgia Tech was good for me. At the end of the first year there, I went into the Minority Coaching Program (sponsored by the NFL) with Dallas and I spent three weeks there. Again, being around a team that had not been successful, I didn’t know that when I spent three weeks with them that they were going to be their first the Super Bowl run under Jimmy Johnson. You knew they were going to be good and you knew they were going to be successful, but you didn’t know that they had those ingredients in place. While he was reinforcing his coaching in Dallas, he was also getting a taste of the ultimate test for a coach — The NFL. “At that time… when I went to the NFL in 1995, it was definitely where I wanted to go,” Godette said. “I wanted to be on the highest level of the profession that I could be on. So at age 40, I had a chance to go into the NFL, I felt I was ready to go. When I first went in there, it was a rude awakening. The first job didn’t end up being that way (good people), but the second job in the NFL with the Miami Dolphins, I ended up having a great time with good people. I had a little bit working for me because I had been in the minority program under Johnson in Dallas. It was being in the right place at the right time… not saying I was their first choice, but I ended up down there. But, there were big differences. “It is a different game in terms of the players getting paid and they don’t have classes to go to, but these guys have the same problems, they just have money,” he said. “It is enjoyable, but it is a different animal when you talk about the NFL versus college. Your talking about kids being demanded to do things on the field but they have classes to go to. On the NFL level you got meetings and football… it’s a job. The younger players, as they come in out of college, they come (under your wing), but as they get older and become quote, ‘a pro,’ they think they got all the answers. But they deal with the same problems you and I do. And as a coach, the decisions are harder, particularly when you are dealing with a man’s livelihood. And though the coaches are well compensated, the NFL lifestyle is not quite the same as the player’s experience. “It is different for coaches because there is more of a reality check for us,” he said. “As a player, it is a fantasy world. From a coaches standpoint it is different because we are not playing. We’ve seen the ups and downs and it is like everything else… when you win, everyone is happy and when you lose, nobody is around and they are kind of booing you. The pressure never changes how you coach. 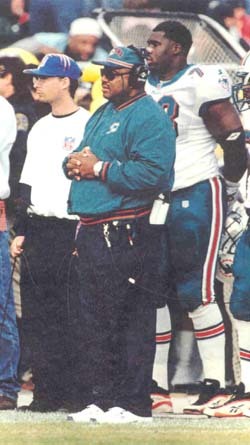 You coach to win and be successful regardless whether it’s the Dolphins or Terry Sanford high school. Ahhh… the lifestyle. For the typical man, the ability to chase his dreams wherever they may take him, requires that he either remain single or find himself a woman who understands ands will let him fly. For Godette, her name is Ruby Lee. It has been odd for Godette this year as he contemplates his future while rehabbing his knee. Godette explained that in the coaching game, things happen quickly. As teams wind down and staffs shift around, Godette will land somewhere, though he does not have anything lined up as of this story’s publication. But there is a place he wouldn’t mind having on his short list. And what would it take to bring him back to East Carolina? It’s safe bet that Godette will be on the sidelines for a team in 2005 and the players on that team will be the ones to benefit the most from a man that Pirates fans fondly recall as a dominator on the defensive line. Q. What did your experience at East Carolina mean to you? A. For me, East Carolina was a positive experience because I went in as a young boy and came out as a man. I got my degree there, allowing me to not only go out and earn a living, but also to be able to grow as a person through the competition on the field, making you reach down and fight when the odds are against you. When you are down, you just couldn’t lay down there, you had to pick yourself up. It made you dig deeper and work harder to achieve your goals and be successful. I attribute a lot of it to my coaches, teammates, and people who were around East Carolina. It was a very positive experience for me. The only thing I have not been able to do is go back there because of the nature of the profession I am in. The time of year when you would like to go back and socialize with former teammates and coaches like others have. I couldn’t simply because it is during football seasons and I couldn’t get back until this year. Q. You did get back this year at the Hall of Fame Weekend. What was that experience like, considering that you were not able to attend your own induction ceremony? A. I had a blast at the Hall of Fame Weekend. My old teammates and I were talking about East Carolina and it does not even remotely favor the same place we were. The facilities and the upgrades that they have done down there are just amazing. You just kind of say, ‘Why can’t you go out and be successful there?’ You should be able to recruit and bring in the athletes you need to be successful because the facilities are in place and they are outstanding facilities. It has always been a great place… whether you are recruiting against East Carolina or working for them. Those kids have a good visit when they come in. Always a good place to visit and a good place every time I was down there and taken a job. In fact, I was talking to a former coach – we were office mates coaching in 1977-79, and when we left for Wyoming, he went to NC State for five years – and he said that his time at East Carolina was one of the most enjoyable places to work. Q. There is a lot of talk about how the BCS may or may not affect a prep player’s choice of schools. Is it safe to say that for coaches, it is the same issue? A. If it were my younger days, I would say that the BCS would weigh heavy in a coaching job choice. But as I’ve gotten older, my priorities have changed in what I look for in a good job. The best jobs are when I’ve been around good people. And not every program has good people. Now, when I’ve been around good people, good kids, good coaches to work with… that’s been the best jobs I’ve had. So, when you talk about the BCS and those types of things, it’s like when Coach Dye came to East Carolina and Coach Randle had those back-to-back championship seasons, and Coach Dye didn’t win a championship his first two years or so, but what he did was take the program a step higher to another level with the competition and from the recruiting efforts of bringing in the ties of eastern North Carolina… pulling people together. That made for a good job. You find a place you can go where you can maximize and bring out the best in people… that is the draw for me. Q. What is your take on the current team? Q. In today’s college football environment, do you believe that it takes a coach four to five years to build or rebuild a program? A. I don’t agree with that notion that you gotta have four of five years (to build a program). I think what it is and I’ve always thought this about Greenville: You go into Greenville, you got to know what it takes to be successful at East Carolina. You’ve got to make sure that you solidify and recruit the base of those kids. Those kids – there are some good football players in those outskirt towns like Robersonville and places like Edenton and Ahoskie. All of those players have been very good to East Carolina as far as football. Those players you have to be sure to lock up. If there is a football player in Eastern NC, you gotta have a chance to recruit that kid and you can’t… you just don’t lose very many of those guys. I think about when we were successful there, we made sure that we got the kids out of eastern Northern Carolina. We got the kids in the Tidewater (Virginia) area and then we’d go down and get a player in Georgia and pick a kid up from Florida, New Jersey and other places. But you got to take advantage of your resources and know what it is all about and touch bases and get to those schools and make those coaches feel wanted and establish a rapport with them, so that those kids are staying close to home. You're going to lose kids, but you got to lock up those you are supposed to get and that is what Coach Dye did so well. The kids we won with at East Carolina were kids that were not necessarily great football players but they were real good athletes, and they could run and they became good football players because of the coaching. That gave us a chance to be successful and win. The one thing that I don’t think ever happened during the era when Coach Dye was there (was) they had more athletic ability than we had. Now they might have had better football players but we felt like our kids could run, jump and go out there with a desire to compete and pride in defending the soil in East Carolina, whether we had to go to Raleigh or Chapel Hill to do it. They played their hearts out for home. Q. You had stints coaching at North Carolina State. What’s the prevailing attitude in the Triangle about East Carolina? A. I won’t say that the people in the Triangle want to hold East Carolina down. I will say, I have sat in a staff meeting before (at NC State) and I’ve heard one guy make a comment. I will say one guy has made a comment and he is not one of my popular guys. He’s the one that has made very derogatory remarks about East Carolina and then his chancellor came back a day or two later to announce a new contract with East Carolina. That guy… you know, the thing… my opinion… why at this day and age with the expense and everyone cutting costs that you wouldn’t want to play East Carolina. In 1991, East Carolina and North Carolina State had to go to Atlanta to play in the Peach Bowl with the biggest crowd they ever had (until the Georgia Dome). Why would you not play that game back and forth down the road? It makes no sense (to oppose that). Q. As a Hall of Fame member, what are you thoughts on the Hall at East Carolina? A. One thing I would like to see – and I don’t know why it hasn’t happened yet – a guy who has done a tremendous job as far as taking East Carolina athletics to another level and they haven’t put him in the Hall of Fame yet is Pat Dye. I really don’t understand how, when you look at the percentage he carried (in wins), what he did for eastern North Carolina football-wise, why that hasn’t been done yet. Correct me if I’m wrong, but what was Ed Emory’s record compared to Coach Dye? Wasn’t Dye’s record better? What he did at that time for East Carolina was nothing short of amazing. I don’t know why it wasn’t done a long time ago. It amazes me. He had a chancellor who was not pro-athletics. Brewer was no Leo Jenkins. Q. Speaking of the administration, what are your thoughts on the hire of new Athletics Director Terry Holland? A. At a time with all the leadership not in place, that gives East Carolina instant credibility with a name guy who has been a successful AD. He is very visible and can go out and do what needs to be done. They went and got the big name and that is good for East Carolina. Q. Will you reflect on some of the big games and rivalries from your days at ECU? A. On North Carolina State: We always enjoyed playing North Carolina State because basically we saw them as very similar to us even though they were supposed to be a class above us. They were still playing with the same type of kids we felt like we had. It was enjoyable to line up and compete against them. In 1976, we had lost to them my junior year and defensively we felt like we had a chance to win that ballgame, but it just didn’t fall in our favor. Offensively, we didn’t put points on the board. My senior year we got them decently. On North Carolina: The North Carolina game… we felt like we were long overdue. The first time we lined up against them my freshman year, they beat the crap out of us and I think they billed it the ACC Champs against the Southern Conference Champs. My sophomore year, we felt like we were robbed because we had two phantom calls come that we never did see on film. One was an interference call on Reggie Pinkney. I mean we were up 21-7 going into the fourth quarter and all of the sudden we start getting some calls that were very questionable. You really… I think we lost the game 28-27 and I mean it was a phantom call on Pinkney that was just unbelievable. We really did feel like we were robbed. My junior year, I think we just beat the crap out of them… really, we got after them pretty good and then my senior year, it was a classic, heck of a defensive football game. The thing that stands out to me, I got a face mask called on me and they were maybe on the 30-yard line and had to go 70 yards for a TD and I remember rolling out and two guys blocking me and I stuck my hand out and got a face mask. That kept a drive going and it just rubbed me the wrong way and eventually I think they kicked four field goals and we ended up losing that one (12-10), but it was a heck of a game. But every time you played State or Carolina, you had to play them on their turf. On Virginia: That one was a time when the NCAA said you could only travel with 48 players. What we did, we came to Charlottesville, we were the away team but you really had no choice but to run the score up. We had a better club than UVA, but I don’t think anyone expected it to be like that. We were expecting a dogfight, but we were very confident that we were the better football team. I remember (Carlester) Crump(-ler) and a bunch of guys going over to Coach (Sonny) Randle after the game…the guys who played for him. Game just kind of got away. We weren’t trying to run the score up, but it just happened that way…the offense was just rolling. Offensively that year, they just got on a roll and the games got ugly sometimes.